SynchroMaster performs foolproof synchronization of files and directories, either one-way or bi-directionally, with many useful options. Synch to local drives, USB and local area network drives either manually or in realtime. Built in scheduler and command line support. 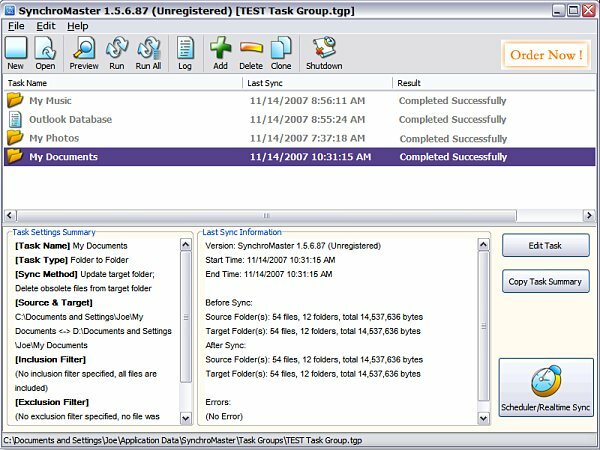 SynchroMaster's user-friendly interface provides an effective and reliable way to keep files, folders and systems synchronized. Backup and synch to Zipfile feature also included. ...... We have specific instructions for how to do this. SynchroMaster also has an exclusive real time synchronization feature, which means that your files and folders will be synchronized as soon as they are updated. Never worry about losing your critical data again. SynchroMaster is the one solution you cannot afford to be without! Easily synchronizes files between multiple computers such as your laptop and desktop PC via Local Network, USB, etc. Protect your data against loss by running regular backups to other media including CDRW, External Hardrives, and other USB devices Protect your Outlook database, Word documents, photos, music and all your other important data from damage or loss! Helps you maintain the newest version of files. Qweas is providing links to SynchroMaster 1.7.2.26 as a courtesy, and makes no representations regarding SynchroMaster or any other applications or any information related thereto. Any questions, complaints or claims regarding this application SynchroMaster 1.7.2.26 must be directed to the appropriate software vendor. You may click the publisher link of SynchroMaster on the top of this page to get more details about the vendor.